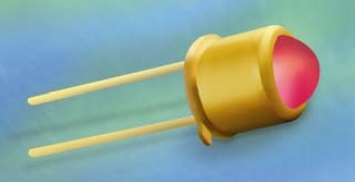 January 19, 2012 – Newbury Park, CA – Opto Diode (www.optodiode.com), a division of ITW, and a member of the ITW Photonics Group, introduces the first of a family of three new infrared (IR) emitters. The OD-850W gallium aluminum arsenide (GaAlAs) LED features a wide-emission angle for coverage over a large area and extremely high optical output (minimum 30, typical 40mW) with peak emission wavelength at 850nm. The new device is an upgrade and replacement for Opto Diode’s OD-880W IRLEDs, offering nearly double the output power, added stability, and much less degradation. Additionally, the 850nm wavelength is more closely matched to the peak response of photo transistors and opto integrated circuits (ICs), making them ideal for industrial control applications such as photoelectric controls and optical encoders. Hermetically sealed, the standard TO-46 package is designed with gold-plated surfaces and welded caps, for added durability. The IR LED offers optical power of 40mW typical at 100mA, continuous forward current at 100mA and peak forward current at 300mA (absolute maximum ratings at 25 degrees C). The storage and operating temperatures range from -40 degrees C to 100 degrees C with a maximum junction temperature of 100 degrees C. Available and shipping now, the OD-850W IR LEDs are priced affordably at $2.80 each, minimum order of 100 pieces.